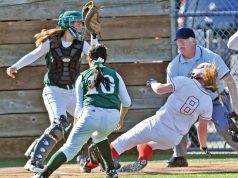 Fielders can often appear to make excellent diving catches, but the calling umpire for the play must have patience in that situation before declaring an out or no catch. 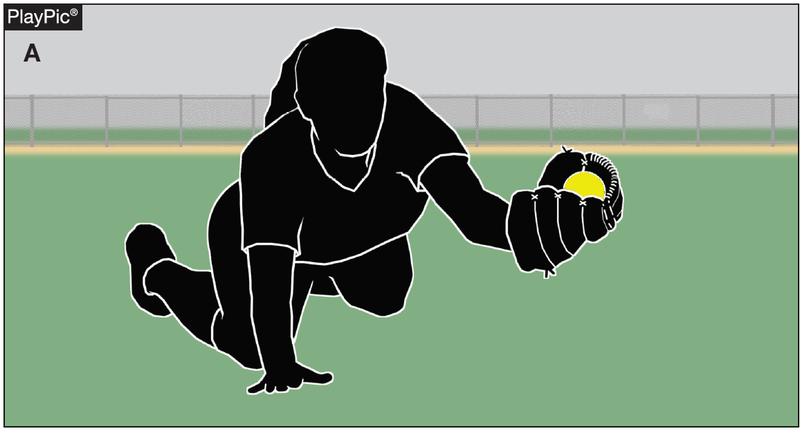 Allow the fielder to complete the catch attempt before making a declaration on the play because in these cases there’s a good chance at a dropped ball. In PlayPic A, the fielder dives for a sinking line drive and makes what appears to be a great catch. She hits the ground and slides a few feet before the ball rolls out of her glove (PlayPic B). Despite F6’s effort to make the catch, it is not legal because the release of the ball was not intentional or voluntary. Time has no significance in determining the validity of a catch. A legal catch is the act of a fielder who has complete control of the ball and any release of the ball is voluntary and intentional. 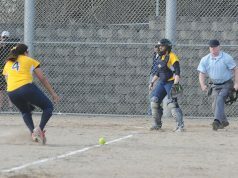 Therefore, if an outfielder controls a batted fly ball into the glove, but as she is running at full speed and attempts to slow down during that continuous action, the force of her running causes the ball to fall out of her glove and hit the ground, she has not successfully caught the ball.